A continuous appeal for public pressure upon both international environmental and governmental agencies for determination of the health of the planet as it is affected by the aerosol operations is established. The unfortunate reality is that such groups in this country have failed to responsibly respond to public request, and most of the responses that have been made are branded with dishonesty and disingenousness. It is now required that not only should the environmental reporting occur in haste, but that such reports must be accompanied by independent audits that have no vested interest in the outcome of the results. It is a sad fact that many of the United States governmental agencies and authorities can no longer be trusted to be acting in the interest of the public welfare. Such patterns became evident at the onset of the aerosol operations that were commenced without public involvement or consent. The best reference for expected conductivity levels in the soil on a nationwide basis found this far is a map issued by the Federal Communications Commission5. This effort was published in 1954 on a nationwide basis, as the conductivity of soils is a significant factor in AM radio propagation. Although general, the source nevertheless represents a major national effort that apparently has not been duplicated since. Conductivity maps and profiles are important as they are one of the best indicators of salt levels that are expected in the soil. There are numerous sources6,7,8,9 that describe the salt tolerances of the native flora, and there is a clear relationship between increased salt levels and decreased productivity of the soil. Increased salts in general, are certainly detrimental (and potentially fatal) to many plant species. The current report is also precipitated in part by direct local observation. The first is the change that has been noticed in local grasslands in the rather severe and hostile environments of the drier southwest. 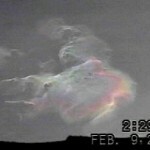 A particular large field has been under observation since the aerosol operations began en masse near the beginning of 1999. This particular field at that time produced grass sufficient to support a couple of horses during the growing season without difficulty, and any changes reported are not a result of overgrazing. Over the years, it has been quietly observed that the grass production has steadily and continuously declined. It has been supposed that the primary cause of this decline has been the drought that affected this area for up to five years. However, as time progressed, it became evident that periods of increased rain did nothing to mitigate the changes. If a large storm or storms were to arrive at an optimum time for growth, the effect was increasingly minimal. It has now progressed to the point where even in the face of record levels of moisture during this last winter and spring, grass simply no longer will grow in that field. It has become a field of weeds (i.e., “an otherwise desirable plant in an undesirable location”) and the livestock has not been able to receive sustenance there for several years now. The second observation considers a major die-off of the pinyon pine species in this area. This die-off is massive and it continues to present a major fire threat to this area. Many may recall the impact of the Los Alamos fire in this area several years ago, which came to national prominence due to the proximity of the National Laboratory. The community report that is circulated states that the past drought “led to stress” and that this stress in turn has allowed the infestation of a bark beetle that eventually has led to current devastation of the pinyon pine species. My interest in this report is to consider a second look at the so-called “stress factors” that may be at play. It has already been reported that the expected effect from the introduced aerosols is to heat up the lower atmosphere10, and not to cool it as many have attempted to promote under the guise of a secret but benevolent motive. Under the best of circumstances it can only be determined that the aerosols will aggravate the drought and warming problems, if not actually induce these very conditions. Reduced forage productivity is already expected in part from the specific heat and dessication properties of the aerosols. Compounding the problem, we must now consider the effects of aerosols that eventually accumulate in salt forms within the soil from precipitation and gravity. This paper considers the effect of precipitation alone. Thirteen soil samples from widely varying habitats in the Santa Fe region have been investigated for conductivity results. These results indicate that seven of the thirteen samples indicate potential cases of salinity stress in the soil that may already be adversely affecting productivity. 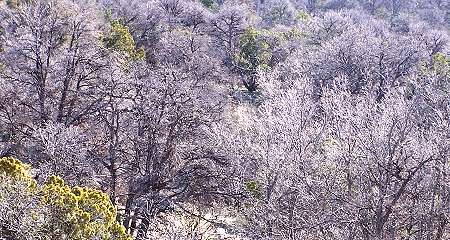 If proximity to vegetation is considered in the case of the pinyon die-off, (to be discussed in more detail), then six out of seven samples indicate the possibility of salinity stress. It is to be considered, therefore, that a harmful salinity problem with the soils may already be in place. The tests indicated here are only of preliminary nature, and they serve the purpose of simply raising the issue of salinity stress within our soils as a result of the aerosol campaign. This complication is in addition to the drought and heat injuries that have already been substantiated. The alarming alkaline results of numerous pH tests conducted by citizens across the country and presented on this site should also be recalled as the grander environmental alteration is assessed. On a more ominous note, if the trends of this study are verified and continue to occur, it can be expected that the situation may deteriorate much further than is already indicated . The conifers and deciduous trees are generally much less salt tolerant than the grasses. The current work indicates that coniferous regions may already be subject to more salinity than they may be able to handle in the future. The recent large scale die-off of the pinyon pine species in this area may only be a harbinger of drastic changes in the future vitality of the forage. It would seem as though if international and national environmental organizations were truly concerned and heeded the signs of planetary change, then they would openly and publicly begin the investigation into the effects of the aerosol operations upon our air, our water, and soil -and all life upon this planet. The quickest way to remedy the problem, during the “investigation” period is to terminate or to force a moratorium upon the aerosol program. Complete and proper testing of soil conductivity will require adequately funded laboratory resources and analysis. The current work attempts to assess conditions within the range of methods and resources available to this researcher. There appear to be two primary methods of soil conductivity analysis. The first of these uses a saturated paste method, and the second sample of soil that is resident within water, often at a ratio of approximately five to one. The EC (Electrical Conductivity) paste method will be preferred should the proper means ever become available. This paper uses the solution technique. The expected measurement scale of results is quite different for each method, and attention must be paid to the units of the results. The method chosen has been to place a soil sample approximately 1cm deep within a clean glass jar (radius 4cm) and to cover it with distilled water to a depth of approximately 7cm. A conductivity reading is taken immediately after the mixing of the sample with the water with a calibrated conductivity meter that measures in uS. The conductivity of the solution is then measured with respect to time elapsed, usually involving a period of approximately 4 to 7 days. It has been found that conductivity in all cases increases considerably with this elapse of time, and it is difficult to reach any other conclusion than that a significant ion leaching condition is occurring. It is expected that the slow leaching of salts within the soil is the most likely producer of this effect. In the references found on soil conductivity testing, this phenomenon appears to be more of an anomaly than a universal result. The effect is significant and has been found to result in increases in conductivity levels on the order of up to 15 times the initial reading given sufficient time. The mixture always will reach a maximum conductivity level after which the elapse of time will not change the result; these are the readings accepted for reference in this study. This maximum has been reached within a week of collecting the sample in all cases. This observation alone may merit further study. A broad range of local ecosystems have been investigated, including lower grasslands (~6500 ft. elev), pinyon pine and juniper forests (~6800 -7500ft. 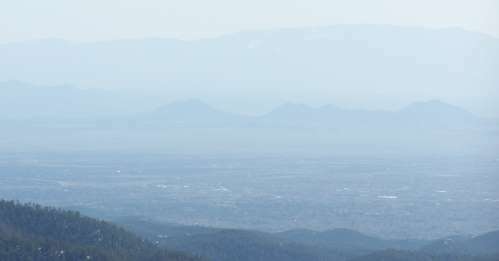 ), ponderosa pine forests (~8000ft), and the upper portions of the local mountain range (10,500ft.). The FCC conductivity map has been examined at the highest resolution available to find the expected range of conductivity values for this region. These values range from 20uS in the mountain forested areas, to 40uS for the northwest region of Santa Fe, to 150uS in the lower plain areas to the south of Santa Fe. The maximum conductivity values shown on the conductivity map is 300uS. In general, the higher the conductivity level (i.e, salt level), the more difficult it becomes to support the higher forms of plant life. In general, the grasses will be found to be generally more salt tolerant, and deciduous tree forms relatively salt intolerant. Numerous references have been consulted to establish the expected salt tolerance levels for the variety of plant species in the southwest and for plant types in general across the country and world. There are some difficulties that emerge in equating measurements of the solution and paste methods; efforts have been made to bridge that gap in a conservative fashion. The lowest initial reading in the soil samples taken is 11uS. The highest initial reading is 130uS. The highest reading of all samples, given sufficient time for ion leaching to occur, is 424uS. The best estimate that can be achieved at this time is that considering all samples taken in all locations, conductivity estimates are on the order of approximately 3 times greater than is expected. It is to be recalled that any increase in salinity levels of air, moisture and soil is to be taken seriously as salts will generally increase and accumulate in soils over time. They will be expected at some level to demonstrate interference with the vitality of the plant. This report makes the argument that such processes may already be in place. The (former) grassland tests indicate that levels of conductivity may already be high enough to explain in part the failure of grasses to grow, even when blessed with sufficient or abnormally high rainfall. It may be that rainfall itself is no longer as beneficial as we would like to believe, especially as reactive metal hydroxide salts now seem to be a regular source of pollution within the rain or snow. The high mountain soil test (not water) at this point has come out favorably. In addition, tests conducted some distance away from dominant vegetation such pinyon or juniper species has raises no undue concern. The mid-level mountain test in the Ponderosa zone (~8000ft.) is not so favorable and does indicate a potential problem that could loom in our future. The extension of the pinyon pine die-off into the higher elevations of this area, to include ponderosa or other conifers at higher elevations, will be truly devastating to this region should it occur. Moisture, the composition of that moisture, and salts in the soil must all be considered as additional “stress factors” that may lead to very serious problems in our future. The pinyon pine die-off region has been especially interesting to study, with some unanticipated results along the way. There remains much work to be done should sufficient interest and care arise. One of the surprising results that has been found is that there is tremendous variation in conductivity with respect to the distance from the bole, or trunk of the tree. Values of conductivity away from the vegetation, in the open, do not pose any special concern that I can determine at this time. Close to the tree itself, however, the results are dramatically different. Conductivity readings (and correspondingly, ion concentrations) seem especially high. 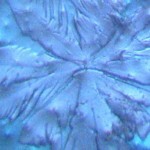 This result was found after unexplained variations within the die-off region was occurring. Proximity to the trees in measurement does appear to be the primary factor that explains this variation. Research was conducted to establish if distance from the vegetation is a known, common, important and expected factor within soil measurements. The answer appears to be no. It has been difficult thus far to find many references to this finding that is being discussed. One paper11 has been found that describes that such a phenomenon can occur, but the audience for the paper appears to be relatively restricted. The second paper12 does not refer to variation with respect to distance, but does explain the majority of conductivity variation from calcium and magnesium salt forms. This question that is being asked here may be much more than academic. The conductivity levels in the immediate vicinity of the now dead trees appears to be unexpectedly high. Calcium and magnesium components are two of the primary ionic salt forms that now are being identified at high levels in rainwater tests. If ionic exchange and ion concentration processes are taking place in the roots and soil in the vicinity of the trees, it seems conceivable that a process of soil saline concentration and accumulation is occurring. If the levels are high enough, and the testing results at hand indicate that they are, then it is quite possible that saline stress is an active process – here and now. The sooner that the comprehensive nature of the die-off of the pinyon pine is established, the greater the chance that extensive and catastrophic larger scale events can be averted in the future. There is no claim here that saline stress is the cause of all of our woes in the plant world. This paper, however, does raise some questions that deserve fair consideration with respect to the massive global effects from the aerosol operations. There is no doubt that global effects are occurring, and many of them have already been, and they continue to be, measured. It is only by being fair and honest with ourselves that we will find these truths. I continue to believe that infinite time is not a luxury you can afford to have at this point. You shall have to answer the question of “ownership” for the air that you breathe, the water that you drink, and for the life and the plants that provide your food. You will need to weigh that answer against that provided by any nation, government, agency, corporation or any other claimed source of power. You then will need to act accordingly. 1. Carnicom, Atmospheric Salt Confirmed, https://carnicominstitute.org/wp/atmospheric-salt-confirmed/, Oct 2000. 2. Carnicom, Calcium and Potassium, https://carnicominstitute.org/wp/calcium-and-potassium/, Mar 2005. 3. Carnicom, Drastic pH Changes, https://carnicominstitute.org/wp/drastic-ph-changes/, Sep 2000. 4. Carnicom, Conductivity : The Air, The Water, The Soil, https://carnicominstitute.org/wp/conductivity-the-air-the-water-and-the-land/ Apr 2005. 10. Carnicom, Drought Inducement, https://carnicominstitute.org/wp/drought-inducement/, Apr 2002.